WELL, IT’S OFFICIALLY 2019 AND WE’RE STARTING OFF WITH A BANG. A heavy workload and high expectations are what we are prepared for this year, but as the saying goes, hard work pays off So we plan on working harder this year than ever before in order to allow readers to reap the reward. 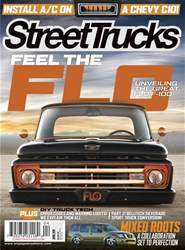 The goal is to deliver a consistent stream of high-quality truck content over many different platforms including print and digital, so sit back and enjoy the steady flow of fresh feature stories.